Have you ever wanted to write a book, a story or a poem, but not known where to start? A friend of a friend recently asked me for some guidance, and I was happy to advise her. I’ve posted my answers to her questions below, in the hope that they will help others in the same situation. If you would like to ask any further questions on the topic, please leave a comment and I will be glad to reply. Is there a specific type of software program I should be using? You don’t need any special type of software to write, and you’re probably best at this stage just to write on whatever software system you’re familiar with, e.g. Word. If you’re not a touch-typist and have to think about what you’re typing, use a pencil or pen and paper instead. There is a school of thought that says writing by hand helps you be more creative and thoughtful, not least because it makes you write more slowly and think before you write something. Some writers like speech-to-text dictation systems – Dragon by Nuance is the most popular, and I’ve found the latest edition amazingly accurate – to increase productivity, but at this point, just use whatever you find the least inhibiting and most practical. Once you have got into your stride, you might like to try Scrivener which is very good for organising long works or collections of short pieces. Do I come up with an entire story line first, organizing thoughts for chapters in advance? Or do I just start writing, letting ideas and thoughts come as I go, or both? Do I keep a notebook and jot down ideas and incorporate them where they belong within the story? I’m concerned about putting it all together in proper order, so I’m not wasting time later. Yes, keep a notebook, which will be a kind of verbal sketchbook. Write down anything in there that inspires or interests you. Otherwise you’ll never remember all your ideas. If you want to write something and you’re stuck, just read through your notebook and you’ll have an instant prompt to start writing. I think it’s helpful to plan a piece of work in a reasonable amount of detail before you start writing, so that you have a structure or roadmap in your head, and it also makes you less likely to go up any blind alleys and get stuck. But some people prefer literally to make it up as they go along. I chaired a fun discussion on this point at the Alliance of Independent Authors’ Indie Author Fair earlier this year – you can watch the video of it here. Bear in mind that every writer will revise and edit a piece of work over and over again, and it’s very rare for a story or poem to come out perfect at first shot. Expect to rewrite and fine-tune your work over and over. Many authors think that it’s best to write your first draft as quickly as possible, to maintain flow and get it done, and then spend very much more time editing. Thank goodness for word processors that make it so easy to amend copy these days! Allow yourself as much time as you need to write, and don’t feel bad about crossing anything out or changing it – all changes will make the end product better. How do I organize content as I’m writing? It depends what you’re writing. Some people write everything in Word or similar, and print out drafts and put them in a ring-binder, then edit them on paper. Others use an online filing system e.g. creating a new folder for each book with sub-folders for each chapter etc. What are the best ways of coming up with ideas for writing content? You need to develop a writer’s eye and ear.Become a people-watcher. Look out for situations, scenes, overheard snippets of conversation as you go about your daily business. If you find any interesting things, put them in your notebook as raw material. Some people like creating prompts by doing things like picking up a newspaper or magazine, picking a few stories at random, and investing a back-story behind the headline. Or you might try turning on the radio at random and using whatever you hear as a starting point for a story. (I did this with my Christmas story, The Owl and the Turkey – based actually on mishearing something on the radio. You can read the result here – and there’s also Shay’s kind review of it there!) Other popular writing prompts are to pick a few words at random from a dictionary and find a way of working them all into a story. Personally, I love writing to prompts – it’s great fun! When is it ok to narrate a story and when to have character dialogue? Again, there are no rights and wrongs about this. Some stories are nearly all dialogue, some have little or none, and plenty are in between. If you are writing in the first person (e.g. there is a narrator who tells the story “I did this” etc) then you will probably have less dialogue than in the third person (when the narrator is not an obvious person). Experiment and see what sounds right. You will probably realise it without even thinking about whether it is right or wrong – it’ll just feel instinctively correct one way or another. If you’re not sure, try writing a scene both ways, and seeing what feels right, and one is sure to jump out at you as being right. Equally, when deciding whether to write a story in the first or third person, if you can’t choose, try writing a passage both ways, and one will feel much better than the other. Writing comes a lot from instinct, not from deciding what rules are and trying to follow them. It’s not like making up furniture from a flatpack IKEA kit. Do I start out just writing a journal for practice of little short stories? Poems? Writing a journal is a really good idea, as it will help you find your voice and get accustomed to setting out stories. I found blogging was really helpful to me, and lots of aspiring writers write blogs when they’re starting out, sharing their author journey. The journal could be about your daily life, or it could be little stories or snippets of story, practising using words in different ways. A lot of people assume short stories are easier to write than novels just because they are shorter, but I know plenty of novelists who claim they can’t write short stories because they need a bigger canvas. I’m the opposite – short stories are what comes naturally to me, after years as a journalist and PR writing short pieces, and manipulating the larger pieces are much more challenging for me. However. I’m now getting into my stride as a novelist, and am a quarter of the way into the second of a series of cosy mystery novels that will be published next year, the Sophie Sayers Village Mysteries. Allow your writing to evolve and you will grow as a writer. Poems are a great way to savour words and phrases and get used to using language in creative ways, but don’t let yourself be constrained by form e.g. they don’t have to rhyme or have the same number of syllables on every line. Basically, follow your heart and your natural voice (reading a piece aloud, by the way, is a great way to see whether it works and what needs editing), be patient and don’t expect fast results, or try to rush, because being an author is a marathon not a sprint. Allow yourself to experiment and play around, and you will eventually naturally lean towards one form or another. If you’re the kind of person who likes joining local social groups, you might look out for a writers’ group in your neighbourhood – though on the other hand these can be offputting, as not all of them are very encouraging! I run two of these, one in Bristol and one in Cheltenham – any aspiring authors nearby are welcome to join. 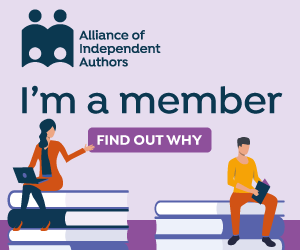 Finally, I’d recommend anyone starting out as an author to join the Alliance of Independent Authors (ALLi) as an Associate Member – you can convert to Author Membership when you publish your first book. You’ll find this global online non-profit group an enormous source of moral support, friendship, networking and practical advice wherever you live in the world. Find out all about ALLi here. Whatever your writing ambitions, I wish you every success! If you have any questions not answered above, please leave a comment, and I’ll be happy to reply. Sorry pressed too soon… your fab book that helps once the book is complete. Although I think it’s worth a read when you’re resting between rewrites. I’ve taken to answering this sort of question with industry statistics. Not because I enjoy disillusioning people, but because anyone not doing it for love, and not driven by their own vision and inspiration, will very likely be ground down. 90% of authors make nothing, or almost nothing from their work. Only 5% make anything like enough to live on. Even trying to tick industry boxes is a very long shot, so do what calls to you, do what you feel driven to do, in the way that speaks most. Excellent advice, Nimue, thank you for that. Too many people still ask questions like “How many books do I need to write before I can give up the day job?” or “How many months/years before I earn a decent living as an author?” Although there are some successful “authorpreneurs” around who are making good livings (largely by diversifying from writing and offering training courses, getting on the speaker circuit, etc), anyone who is motivated by money needs this kind of reality check! Thank you , Debbie. Clear, condensed and such a helpful reminder that that there’s not one ‘best’ way to write a book. I planned my debut novel quite carefully, but when writing the first draft found that I often needed three or four scenes to achieve my plan for only one scene. Also, I often got better ideas while writing. However, after 15 drafts, I’m finally publishing the first in ‘Fiji Islands Mysteries’ in October. Hope I’ll be more efficient in writing the second! Thanks for the reblog, Loretta, I’m really glad you found it helpful.